Earlier pages such as examples of canals and ponds in the Paraguay river show examples of engineered canals and ponds in the Paraguay river and examples of canals and ponds in the Parana river gives further examples. 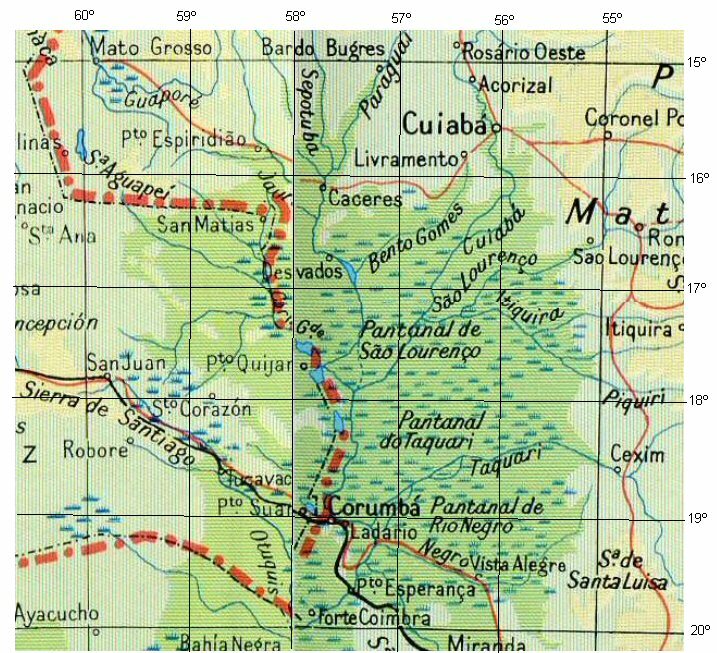 This page looks at the region of the Pantanal and finds evidence of similarly engineered artificial ponds and canals in what has been thought to be a natural marshland. For modern Europeans, a marshland is not thought of as a friendly environment, but more of a place to be drained, ploughed up then farmed. But for the peoples of ancient South America, marshland was clearly "home" and desirable on account of the many kinds of wildlife that is attracted to a watery environment. Instead of creating canals to drain a landscape, they actually created canals in oder to bring water and flood a landscape and lived on artificial islands and lagoons such as have been seen in the Beni region of Bolivia. Depending on the type of landscape, canals were not necesarily in straight lines either, but were also engineered to follow the contours of the land sometimes looking like the contours on a modern map, other times just following the natural inclination of the water flow. Such examples are given here thanks to the latest Google earth high resolution satellite imagery. A typical landscape of canals and ponds in the upper Paraguay river or Pantanal. This medium resolution image is not capable of further enlargement. This typical pond measures about 1000 metres or 2000 Sumerian cubits or 5 furlongs and is similar to those seen in the Beni. This high resolution image shows a familar landscape of canals, artificial islands and ponds. The canals are not at first noticable or clear since many have become clogged up with vegetation or dried up altogether such as the transverse channel annotated above. Example of channels clogged up and initially hard to detect. Overgrown complex of channels, islands and ponds with a modern facility nearby. Ponds and islands may not seem clear due to overgrowing vegetation but are helped by higher water levels. Complex of channels, islands and ponds. The two central ponds have beautifully sculptured oval shapes. The central pond has a length of about 400 metres or 800 Sumerian cubits or 2 furlongs. The islands also have beautifully sculptured shapes. Examples of artificial ponds overgrown with vegetation. The further we pull back, the less clear but examples of artificial ponds overgrown with vegetation can still be seen. Less clear but examples of artificial ponds overgrown with vegetation can still be seen. The close view shows the clear outlines of artificial ponds and canals overgrown with vegetation. Less clear outlines of artificial ponds and canals overgrown with vegetation. Less clear outlines of artificial ponds and canals heavily obscured with vegetation. Another example of artificial pond about 400 metres or 800 cubits long. Sculptured ponds (left) and sculptured island (right).